This room emerges from a gut renovation where large areas of the home were replanned entirely. Additions also played a part in supplementing some 9,000 square feet of space. 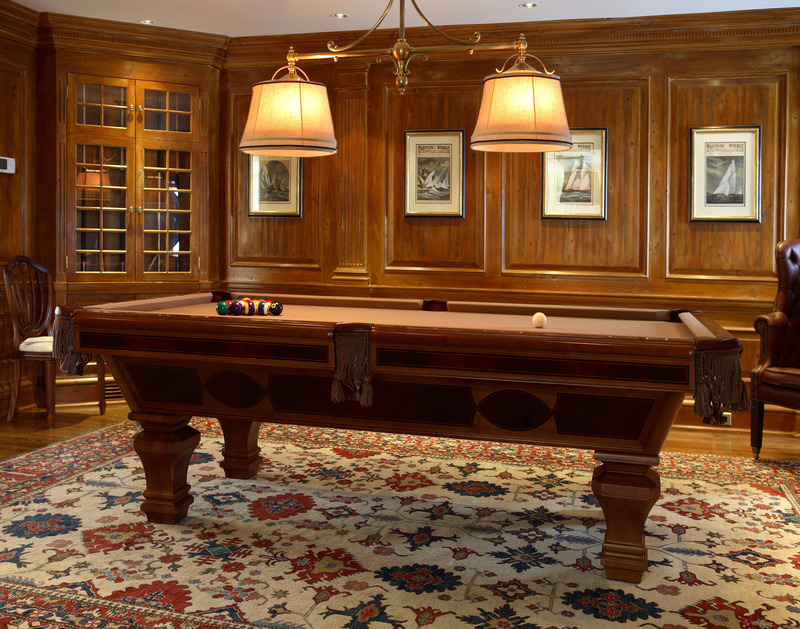 A new billiards room was a natural fit in the restoration of core first-floor living spaces whose locations were maintained although stripped of finishes. The billiards room replaces a poorly executed library/office space with veneered plywood shelving, unoriginal to the house. However, the existing space occupies a prime location on the first floor. Nestled between the living room to the west and new sunroom to the south, it enjoys seamless flow between rooms and is the prime entertainment space in the house. Two eastern-facing windows flank the existing fireplace with views toward the front yard and entry motor court. A third window was added facing south, facilitating Long Island Sound views. 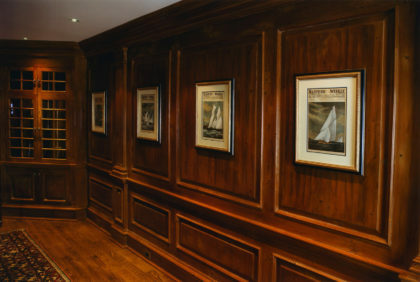 The walls of the room itself are finished in pine raised paneling with a stain and wax finish. Continuous horizontal elements include a six piece ceiling cornice, chair rail, and baseboard. 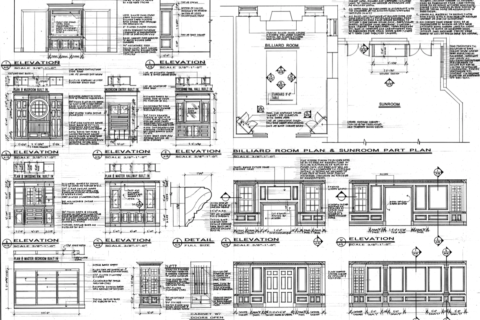 Fluted Tuscan pilasters articulate the panel layout on the north wall and reinforce the classical aesthetic of the room. Corner cabinets with twelve lite glass doors and integral transoms provide ample pool cue storage with minimal projection into the space. 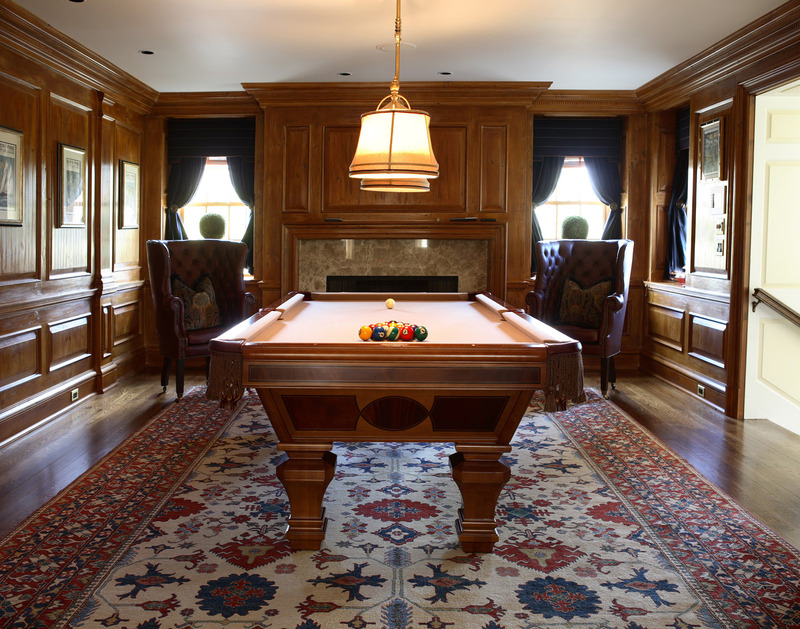 Since the renovation was completed, Soper Babcock Associates has been told by the owners that visitors, upon seeing the billiards room, believe it to be original to the house. That was precisely the reaction we had in mind while designing this space.